For those who already listen to the Holo Deck podcast you will know that the show looks at Star Trek through comics. There are over four decades of Star Trek comics spanning over 600 issues including some amazing stories written and drawn by some of the greatest talents in the comic industry. As well as helping the listener discover these amazing stories Michael has started a series of interviews with those writers, artists, editors that have made an impact in the Star Trek comic world. Michael’s aims for the interviews are for the listener to understand and appreciate the whole process of writing, drawing, editing a Star Trek comic. Michael feels that if the listener can see that these incredible talents put so much effort and love in to creating a Star Trek comic then this will encourage more to read the comics and for the comics to be given the credit they deserve. This Saturday I continue my interview series by speaking to Bob Greenberger. Bob was the editor of the Star Trek titles at DC comics. I feel that Bob helped shape Star Trek in comics and began to show that Star Trek worked in the comic format and this was a golden age for Star Trek comics. Bob worked on some wonderful stories working with writers such as Peter David, Michael Jan Friedman and artists such as Gordon Purcell. As well as his time in the comic industry Bob is also an accomplished author having written several Star Trek novels & many non Star Trek books. I have also interviewed comic illustrator J.K. Woodward who discussed his work on the historic Star Trek / Doctor Who crossover series. J.K. spoke of his love for both franchisees, the process of drawing such a story and how he had to audition to CBS and the BBC! Recently I also interviewed comic writer and artist Zander Cannon. In the interview we discussed Zander’s IDW five part Star Trek: The Next Generation series “Ghosts”. Zander explained the process of writing a comic and to help us Zander provided us a copy of the script and storyboards he used to assist the artist (you can see these on the website). Zander also gave us his views on the JJ verse and Enterprise. I can promise there are more interviews planned for 2013. Stay tuned here and don’t forget to add the Holo deck to you “pull list”…. I knew yesterday (Wednesday 5th December) that the trailer for Into Darkness would be coming out on Thursday at some point. I am sure the the whole Star Trek world knew. I was excited but actually managed to get some sleep last night (always a bonus for me). Then this morning the time had some, I looked at the trailer and after watching it doubt I will get any sleep now until May when I have actually been to see the film! Now I don’t know about you but that left me with loads of questions. We had phrases like “force of terror”, ” a one man weapon of mass destruction” which means to me they may be resembling real time events? Something Star Trek is well known for during it’s long history. “Love will be challenged” which as a reader of the IDW ongoing Star Trek comic (which is considered cannon by JJ) you would know that Spock & Uhura are having a hard time at the moment, will events in this film push their love over the edge? “Friendships torn apart”, that could mean anyone but I would think within the triangle. Finally “sacrifices must be made” can only mean someone will die..or does it? Then came the poster. 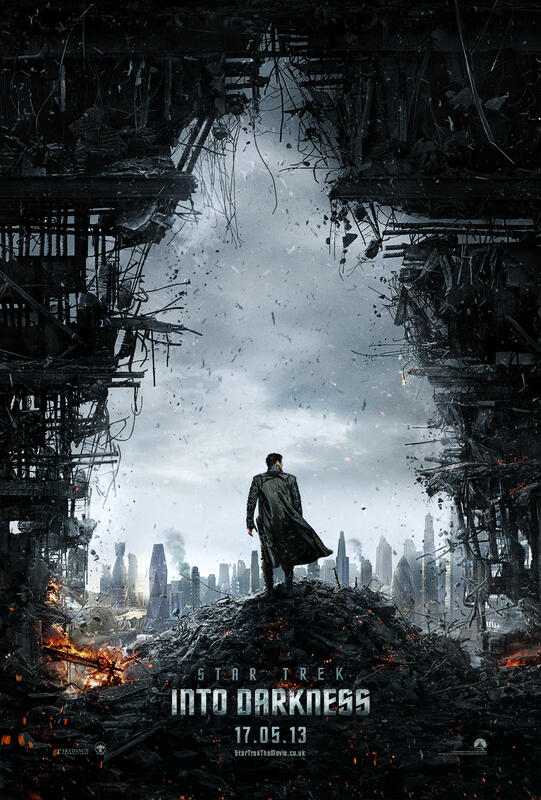 We see Benedict Cumberbatch standing over a destroyed building with London in ruins (nice touch by the way considering BC is British) with the starfleet logo carved out from the destroyed building. For me this poster said this film is going to be epic on a mass scale. That we are finally going to have a villain to match Khan (unless this is Khan version 2.0) and that we are in for a hell of a time in May. We see San Francisco all seems quiet while BC tells us that although we think our world is safe we are wrong. All seems grim already. BC is just great and so far we are only hearing his voice. Kirk is running from some “red fields, jungle” and then jumps off a cliff. Is that McCoy with him? Who is he running from? Looks a great action scene, something we come to expect from JJ and after the first film something we would expect from Kirk. We see the blond & very beautiful Alice Eve with Kirk, later on we see her in a Starfleet uniform.Could she be Elizabeth Dehner or Carol Marcus? Most on twitter now think it is Dehner but we shall see. We finally get to see BC. He jumps in and almost at once Kirk & Uhura recognise him. I do mean jump! Does he has superpowers, is he a genetically engineered human or just another god like alien? At this point you could go either way with Khan or Gary Mitchell. Again Twitter thinks Mitchell. Are they on Ceti Alpha V? BC tells us he has come to “have his revenge”! On who? Is it Khan, are we going to see a retelling of “Space Seed” in the “Countdown to Darkness” prequel comic from Jan to April 2013? Is it Mitchell? 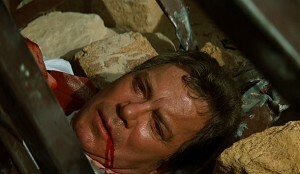 We know that in the comic and classic TOS episode Kirk had to kill his best friend to save the Enterprise and his crew. Could it be someone else? Again in the comics we have seen some very strange behaviour from Starfleet, almost to the levels of Section 31. Could this be connected? So many questions. Next we see some action scenes, all great stuff that shows we are going to have a roll coaster of a ride in May. We see explosions, we see a starship rising out of the Water (is this the Enterprise? )we see fights, we see Spock, Uhura all tense. We see Kirk, damage all around him and in the background we hear BC say “Is there anything you would not do for your family?” which then cuts away to a scene where you see someone in blue holding out his hand in the Vulcan salute to someone in black reaching out to that hand although there is a glass wall in front of them. Now knock me down with a feather. It must be Spock & Kirk? Have they just told us that BC is Khan, that this is a rerun of “The Wrath of Khan”? What do I know, my mind is racing around at wrap nine trying to figure this all out! 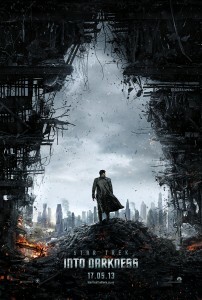 What I do know is that Star Trek Into Darkness is going to be great! Does killing off ongoing / recurring characters from Star Trek make any sense? 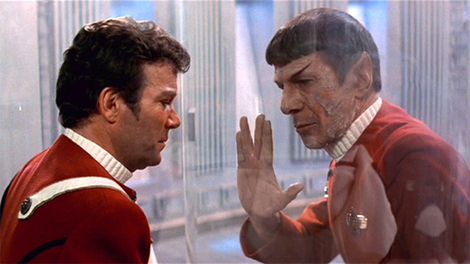 If we take away the countless “Red Shirt” deaths from the Original Series my first experience of death in Star Trek was that of Captain Spock in “The Wrath of Khan” What an emotional wreck I was when I saw his final scenes with Kirk in engineering. How could you not get emotional? The death of Spock was meaningful (well perhaps not to a ten year old). He had just saved the Enterprise from the detonation of the Genesis device and thwarted the plans of Khan. Spock’s sacrifice allowed for Kirk to be reborn, feeling young again at the end of the film finally understanding that he still has a life ahead of him. Kirk finally has to confront death, something he has avoided his entire career in Starfleet. This was not a simple plot device to shock the fans (though it did and that’s another story entirely); the death of Spock meant something to the overall story of the film. If we were to use Spock’s death and that of Edith Keeler in “The City on the Edge of Forever” as the guide to how a death should have meaning in Star Trek how well did the writers do over the years? I want to look at two of those deaths and wonder did they make any sense. Trip was not my favourite character in Enterprise. There was something about him that annoyed me so much. However, his death in “These are the Voyages” is most probably the stupidest in the entire franchise. This was the last episode of the series. Instead of getting the strong send off the series deserved (well it actually deserved a fifth season) what messes Berman & Braga came up with were a “mish mash” of a TNG / Enterprise story that did a disservice to both series. This was just shocking on all levels. 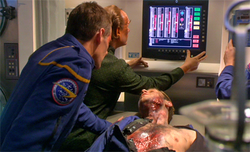 While trying to protect his friend and Captain from the enemies of Shran, Trip is killed in an explosion. Did his death move the story along? Did his death have the same sacrifice as that of Spock? I don’t think so. This death did nothing except provide the audience with a shock (that soon turned to outrage) that they had killed off a main character. You have to question the logic behind the decision. Connor Trineer who played Trip once said at a convention that it was simply to get the fans talking and that his character had survived much worse than this over the four years. A senseless death in a senseless episode. Although in the ongoing novels of Enterprise that is set after the series Trip is alive and well which is great news for all you Trip fans but as far as CBS are concerned books are not “cannon” and as such Trip is well and truly dead! The second death I want to look at is that of Mr. Carey of the Starship Voyager from the episode “Friendship One”. As we know Voyager gets it first “official” mission from Starfleet Command to locate an ancient probe sent out from Earth. While locating and attempting to remove the probe the away team is captured. During negotiations with Janeway Mr. Carey is killed as a sign to Voyager that the hostage takers mean business and that their demands should be met. While “Friendship One” is not a bad episode (although I know someone who would disagree with me) I found the death of Mr. Carey somewhat pointless. Voyager was now only four episodes from getting back to Earth in “Endgame” and I think that the writers wanted us to feel that the death of Carey was indeed such a loss considering that they were so nearly home. However, while I understand that aim I felt that the writers chose the wrong character to die. For us, the audience to feel the emotion of losing a character so close to the end of the series they should have allowed one of the main cast to die. We had not seen Mr. Carey since “State of Flux” which was in season one so expecting us to being saddened (though loss of any life truly is sad) I feel is somewhat misplaced. How could we feel anything since we had not seen his character develop over the seven years? His death reminded me of a “Red Shirt” death back in the Original Series. Did the death of Carey add anything to the overall story line that couldn’t have been achieved without killing him? I don’t think so. The writers should have killed Neelix or Tom Paris. At this point we did not know the future of Neelix so having him killed without ever seeing Earth, the home of his friends and their obsession over seven years would have made his death more tragic. Tom Paris now married, with a baby on the way. How dramatic and moving would it have been to kill him before he sees his baby or Father (after just reconciling). Of course the writers would never have killed Tom due to those reasons but they could have at least killed Harry Kim. The death of Carey was simply there for shock and not the plot. There have been a lot of ongoing character deaths in Star Trek over the past 46 years. Some of those include: Tasha Yar, David Marcus, Tuvix, Jadzia Dax (so wrong on so many levels), Ziyal, of course Data in Nemesis (another awful & needless death) and eighteen years ago we saw the death of James T. Kirk in Generations. For every Spock there is a Trip Tucker. When killing an ongoing character it should not be taken lightly. Does the death allow the story to progress, what impact will the death have upon the series and audience? All good questions and I wish that the writers of Star Trek had just sat back, considered these questions (and many more) and perhaps had not rushed into killing anyone off unless it was the right thing to do and done in the correct way. After all not everyone has a Katra and eternal soul.